Over the years, I have been asked a kazillion questions about tumble polishing jewelry. One would think it's a pretty cut and dried task to tumble jewelry. However, there are some tips and techniques that I've learned over the years which may help give you better results from your rotary style tumbler without having to learn some things the hard way. This is a long articlethere's so much to talk about so you may wish to grab your favorite beverage before reading on. Why indeed! When I first started making wire jewelry, I didn't tumble it. But now I can't imagine NOT tumbling as part of the finishing process for my jewelry! Tumbling burnishes the soft metals like silver, gold and copper, making them shiny and polished looking. It also removes any excess patina residue or crud etc... thoroughly cleaning the items and softening any plier marks and metal burrs. It also helps to harden the metal, making it more durable and better able to hold its shape. Basically, you add stainless steel shot into your barrel, just enough water to cover the jewelry and a squirt of liquid dish soap. Put on the lids and let it go! One pound of stainless steel shot is perfect for a 3 pound tumbler like a Lortone 3A or Chicago brand machine from Harbor Freight. The Lortone machines are known as the best. The 3A - 3 pound capacity tumblers average about $85 retail. Harbor Freight offers the same model of tumbler made in China for around $30. The HF tumblers are noisier and the belts don't hold up very well. 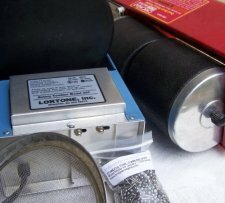 I've replaced the belts in my HF tumblers with the much longer lasting Lortone ones. The Lortone belts for the 3A tumblers retail for less than $2 each. Tumblers are designed to run 24/7 for years. The motors of both brands of tumblers I own are working just fine after 5-6 years of hard use. I also have some larger capacity tumblers with bigger barrel sizes like the Lortone 4C and the QT6. Because I make big and sometimes heavy jewelry and lots of choker-style necklaces, I needed the bigger barrels. However, a bigger barrel means more shot is necessary to get the best results. You can also get a double barrel tumbler, Lortone 33B or HF double barrel which look like two of the 3A styles put together. The HF tumbler is a great value for a small investment once you put a decent belt on it. If you have the means to start out with a Lortone, they are very nice machines. I prefer a stainless steel shot called a 'Jewelry Mix' which is made up of several different shapes of shot. Each of those shapes performs a different task in the tumbler to polish and clean the items in the barrel. It is important to use stainless steel shot. At some point regular steel shot will rust...stainless steel shot will not. I've left the shot in my tumblers - I own four of them - for years and there's not a bit of rust in the lot of them! There are other media that some folks like to use to tumble polish jewelry and I'll talk about some of those later in this article. Dawn™ dish washing liquid acts as an agent that holds all the yucky stuff (impurities etc...) that the stainless steel shot removes from the metal. When there are more impurities being removed than the dish soap can handle, it will happily re-deposit itself back onto the metal...hence, the greyish, bluish looking metal. You just need to tumble a bit longer with fresh solution. When your water is thick and black...time to change it! Sometimes when the items are really oxidized, they need to be taken out, re-buffed with the steel wool or 3M scrubby pad and then put into a fresh solution. Other times, you just need to change the solution. I know it sounds like a pain, but eventually you just learn by looking at it just what needs to be done. You can then tumble some more...about 2 hours should do it with a fresh batch of clean water, clean shot, a freshly scrubbed or rinsed rubber barrel and a squirt of Dawn™ (about one teaspoon for a large tumbler, half that amount for a smaller 3 pound size.) If some of the components you use in your jewelry won't allow you to tumble for long periods of time, then you can use a polishing cloth that will remove the discoloration from your metal. Tarnex™ will remove ALL oxidation from the silverplease don't use it on copperbut leaves the silver dull and sort of a whitish, yellowish yucky color. But...the oxidation is gone. :) You can then polish with a polishing cloth or re-tumble using fresh solution and it will shine right up! I think the most common problem with tumbling is that we don't change the solution often enough or we get in a hurry for the items to be done and don't leave them in long enough. Refreshing Bali beads, etc. usually takes about 30 minutes to one hour. Be sure to string any beads that have holes in them large enough for the shot to get into!! Otherwise you'll be spending oodles of time picking shot from the beads or just having to scrap them. FOLKS, STRING THOSE LOOSE BEADS BEFORE YOU TUMBLE THEM!!! With today's silver prices, it's just too darned expensive not to...not to mention frustrating, heartbreaking, maddening, and the general good ol' stupid feeling. True gold-filled wire tumbles fine and should not have a coating that can come off like a plated wire will. Gold-filled is made by fusing a layer of karat gold to a suitable supporting metal. This is accomplished using very carefully controlled pressure, heat and time. The bond produced is permanent. 1. Dissolve one teaspoon per 1 cup water of baking soda in a small glass or plastic bowl. Old margarine tubs are good for this. 2. After removing and rinsing your freshly LOS'd item, put it in the baking soda/water solution for a minute or two. This will neutralize the LOS and stop the metal from continuing to oxidize. Tumbling is not a cure-all. It will not remove all the excess oxidation from LOS'd items. Not even if you let tumble for days! It will just polish them up. YOU must remove the excess oxidation BEFORE tumbling or afterward with elbow grease and a polishing cloth (or a flex-shaft and polishing wheel. :)) Sometimes, I tumble first, then oxidize, buff and it's done. The de-burring solution for copper and silver is nice, but a word of caution on it. It is very, very concentrated. A little bit goes a loooong way. If you add too much to the barrel, it can actually make the copper come out dull and yucky feeling/looking. It does do a pretty good job of stripping away most the dark patina! I use it when tumbling jump rings and not much else. Nothing porous like turquoise and pearls in the LOS. They will absorb the solution and get discolored. Soft and porous cannot be tumbled either. Now, lava rocks are porous and can handle the LOS AND the tumbling. While being porous, they are very hard natural volcanic glass. However, their holes are just the prefect size for plastic and stainless steel pellets to cram into. They don't come back out either! So they are a no-go for the tumbler! While there are some turquoises that will not be harmed by the process, you never know...so it's best not to chance it. Also, tumble like with like...a few heavy bangles/bracelets or a bunch of earrings or ear wires, but not the light and heavy stuff together. Heavy items can damage delicate items. And don't overload your tumbler! That will stress out your motor and the belt. Best to tumble several smaller batches than try to stuff everything in at one time. You'll get a better finish if the shot can reach all surfaces of the items tumbling. Does tumbling stones improve their appearance? Yes and no. Tumbling gemstones with steel shot will not polish them. For those, you must use special polishing compounds. I recommend using a different barrel too! But polishing stones is a topic for another day. I have found that Swarovski crystals do fine in the tumbler. Just make sure that you don't tumble heavy stuff with light, delicate things. To do so could damage the light stuff. Never tumble turquoise, pearls, dyed corals, or other soft gem materials. I have successfully tumbled the amethyst and smoky quartz gemstones that I use in many of my earrings. I have plastic pellet shot that I sometimes use with really delicate items as it is not as harsh or heavy as stainless steel. I use the Dawn and water just like with the steel shot. However, this is really just to thoroughly clean the items and not to polish them. There are dry media like walnut shells, but I find it to be very messy and all those little walnut bits jam into every available hole! I have not had any success with rice either...it powders and, when wet, that powder turns to glue. I hope you are not more confused than ever! I DO throw just about everything in my tumbler, but I am careful with the gemstones. Choose your tumbling 'partners' carefully. I don't tumble delicate gemstones and earrings with heavy bangles, etc. Earrings on a whole, come out just lovely from the tumbler. Have fun experimenting! "My silver is coming off the beads or turning grey and won't shine up!" Are you sure that your silver colored bead is really Sterling? Sometimes 'silver' beads have a very low silver content, not qualifying them as true Sterling silver and whatever they may be alloyed with could be causing a problem. "My Sterling silver comes out of the tumbler looking like hematite!" 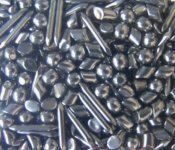 Give the 'hematite' beads a Tarnex¨ bath and rinse or burnish with 0000 fine steel wool. Wash the shot in your tumbler, give the rubber part just a rinse with sudsy water and re-tumble. Another possibility and where you could be picking up the contaminating culprit is in your water. Are you on a well? Try using a bottle of distilled water from the store. "What are the silvery marks on my etched lampwork beads?" Stainless steel shot can and will discolor glass lampwork beads that have been acid washed, giving them a slightly rough surface like sea glass. The steel shot transfers itself on the surface leaving little silvery streaks on the glass. Sometimes, I've had to re-etch the glass as they come out of the tumbler with little shiny silvery spots all over them! So now, I tumble the components ahead of time and don't put etched glass in with the stainless steel shot. You can tumble it with plastic pellets with no problems, but this method really only works well to clean the pieces but does not polish the metal. If it really needs to tumble, the etched beads are usually OK with just a short time in the tumbler - like an hour. "YIKES! My polymer clay beads came out of my new tumbler looking yellow!" Often, a new rubber barrel leaches a substance that will stain porous items like polymer clay a yucky, yellowish color ruining them as it does not come off. To avoid this, 'season' your tumbler barrel by using it with metal and glass items for a few weeks until the leaching stops. Your barrel will then be safe for tumbling the PC. You can always test the barrel first by adding a white test bead and tumbling it for 4-6 hours. If it comes out white, you're good to go! This is more of a problem with the HF brand. "I can't get all the black out of my tumbler...I've been scrubbing it for days!" You could be just scrubbing the rubber right off! LOL The small black rubber particles will be held in suspension by the dish soap and should not harm or discolor your jewelry. But seriously, please don't scrub so hard as to damage your rubber barrel! It is important to thoroughly rinse the pieces you've oxidized with Liver-Of-Sulfur and to wash your shot. This helps make sure no residual LOS is being added to and built up in your tumbler. To make certain you stop the oxidizing process, do the following steps. Still have questions about tumble polishing? Just ask them on my Tumble Polishing Q & A page and I'll be glad to help! Return from "Tumble Polishing" page to "Jewelry Making Tips & Techniques" page.